Paul Nicholls saddled his first winner at this year's Randox Health Grand National Festival when McFabulous landed the G2 Weatherbys Racing Bank Bumper, the closing race on Ladies' Day. The Harry Cobden-ridden five-year-old (2/1f) beat Thebannerkingrebel (14/1) and Santa Ross (3/1) by 1l and 2¾l. McFabulous was bought by bloodstock agent Tom Malone for €88,000 as an unbroken store horse, and he has gone on to become one of the brightest hopes among Nicholls' academy of high-quality young horses. His only defeat in four bumper races this season came at Cheltenham in November when he was found to have sore shins after finishing unplaced. He came back to form with a win at Newbury last month. Nicholls said: "He's a lovely young horse and he's been schooled over hurdles and jumps them well. He'll make a lovely novice hurdler for next season. "I have a lovely lot of bumper horses to go hurdling next season and he probably heads them up. "He didn't come down the hill at Cheltenham in November, but he had sore shins, and so we left him alone until February and then went to Newbury. Today he was a bit green around the bends but he's still learning and he's getting there all the time. "He won't run again this season, and usually I don't like running horses in four bumpers, but he won so well at Newbury that we had to come here - and then it rained and the ground was perfect for him. He has a proper pedigree, he's not slow and he'll start over two miles next season." 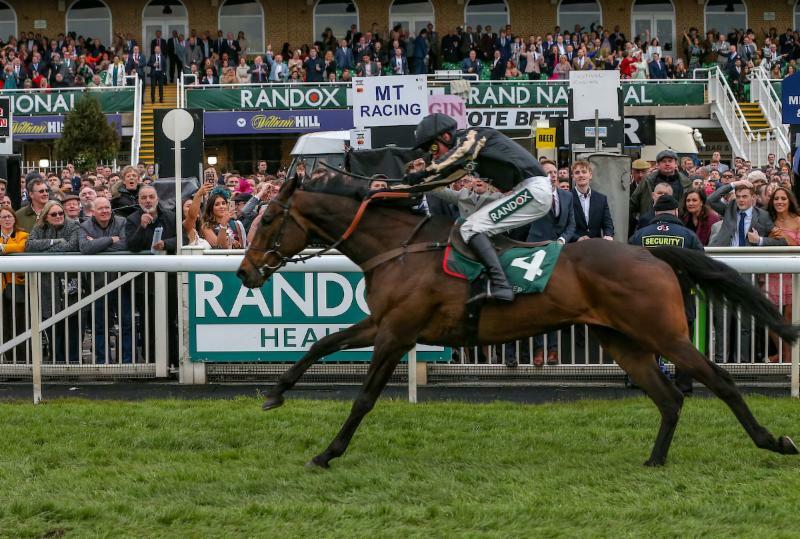 Jockey Harry Cobden steered 2/1 favourite Mcfabulous to victory in the concluding race on day two, Ladies Day, of the Randox Health Grand National Festival, the £45,000 G2 Weatherbys Racing Bank Standard Open National Hunt Flat Race. Trained by Paul Nicholls, the five-year-old son of Milan recorded a length victory over the Jamie Snowden-trained Thebannerkingrebel (14/1). Winning rider Cobden said: "McFabulous is still very green and raw, but he has got a fair engine under the bonnet and is learning all the time. "Around the bends, he is still slightly unbalanced, but he will be a nice horse for the Supreme next year anyway. "We have schooled him plenty at home. He was jumping around our school as three-year-old so hopefully we will not have to teach him to get his feet off the floor. I am excited about him for next season. "It's great to have a winner on the day." Thebannerkingrebel, a 14/1 chance, delighted his trainer Jamie Snowdon after coming second to the 2/1 favourite Mcfabulous in the Weatherbys Racing Bank Standard Open National Hunt Flat Race, the last on the card on Ladies Day, the second day of the Randox Health Grand National Festival 2019. Owned by Sir Chips Keswick, chairman of Arsenal Football Club, who wasn't in attendance and trained in Lambourn by Snowden. Snowden said: "He had a serious wind problem and he was in the vets for three and a half months on the back of it. "That was some performance, and he was too keen early on, he was a bit lit up by the occasion. He has run a blinder. I think he shows enough speed to win on the flat, he was probably just out-stayed by the winner. "We will go maiden hurdling next. We will hopefully win our maiden hurdle in May. He will be a lovely hurdler next season. We will make our way to the Supreme Hurdle hopefully. Sheehan added: "He was too keen. He has run a massive race to be second but you can't be that keen and finish. He has had a long time off. He pulled up at Cheltenham on his last run which was over a year ago. "All credit to Jamie and Sir Chips for sticking by him."